Hey! Happy hump day, guys! We are going to make it! Quick Unimportant Updates: Reuben and I watched Ratatouille over the weekend and it was wonderful! Next Food Network Star is back on and my desire to try out/practice has been reignited. I think Giada would be into me. Russell Sage tapped out on Naked and Afraid XL and the the women who watch this show (is it just me?) rejoiced! Ever since Reuben started @beermeatsbread, we've been collecting the beer cans in a nice clean bag and handing them over directly to the sweet old asian ladies/gentlemen that collect cans. You should do it too! It makes them so happy and their happiness will make you so happy! My Love Hate Relationship with SF Update: Lately, I've been really overwhelmed/overstimulated by downtown San Francisco. My new work commute and new office location is a lot more "active" than it was before. The bus I take now is more cramped with a constant flow of people squeezing on and off. I walk right through the tourist center downtown to get from my bus stop to work and there are so many crazies! There is woman at my bus stop that hisses at everyone. And ugh. The smells. This past week alone (it's only Wednesday) I've see some nasty (I mean real nasty) things doing down on the block my new office is on. I'll spare you the details. I don't know if I'm just being a wimp or if anyone else who works downtown feels this way, but it's just a lot! I cry a little inside when I have to leave the safety of my Inner Richmond apartment... jk... but sort of. I've talked about this before, but I'm an easily over stimulated person and I have to really work on including daily routines and rituals into my life that calm and center me. SF stresses me out. I juggle a lot of random passions and I don't want to give up any of them. I try to be a good friend/girlfriend/daughter/sister/niece/cousin. I hate disappointing or saying no to anyone. A lot of times, I feel like all these things pull me into every direction, but I just want to stay wrapped up in my blanket... alone. Sometimes, my emotions get the best of me, but I try my best to keep my mind balanced and in check. Although, this overwhelming feeling is the reason why I paint and cook. It's how I focus my thoughts and relax. Chopping vegetables and watching watercolors move on paper is so cathartic. Mental health and wellness is so so so so so important and I wish more people made maintaining their own mental health a priority! Just a little perk! These pork chops are juicy and pack a flavor punch after some sweet caramelization in the pan. But, the unexpected star of this plate is the coconut rice. It is incredible! I want to take a nap on a bed of this coconut rice and never take the bus downtown again! For real though, this rice plate is I'mgoingtoinhalethis good. 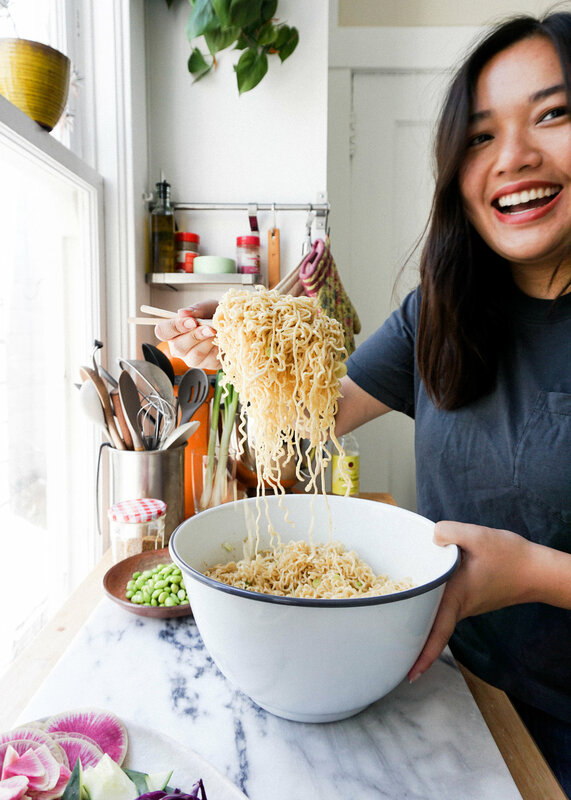 It's just like those giant meat and rice plates you get from your favorite Vietnamese place. I'm sure this will be on my dinner menu rotation if we move out of SF into the rural Ohio countryside. Aaaa the dream. Make a pork chop, paint some flowers, dance your pants off, run 10 miles, watch Say Yes to the Dress, do what you got to do to keep your mind in tip top shape! 1. Start by making your coconut rice. Add rice to the bowl of your rice cooker or pot and rinse under cold water until the water runs clear. Add coconut milk, water, brown sugar and salt to the rice and mix to combine. If cooking in a rice cooker, cover with lid and simply press "cook" and wait until it pops to "warm". If cooking in a pot, bring the pot to a boil and then cover with lid and reduce to a simmer on low heat. Cover and allow to cook for 40-45 mins. In both instances, once the rice is done cooking fluff with a fork of rice paddle and cover again to sit for another 20 minutes. The rice will still seem really wet, but after 20 minutes it will be light and fluffy. 2. While your rice is cooking, mix together shallots, garlic, brown sugar, fish sauce, dark soy, rice vinegar, and black pepper. 3. Season your pork chops on both sides with salt and poke them with a fork to help the marinade soak in. Transfer pork chops to a gallon size ziplock bag and pour your marinade into the bag. Seal bag and allow the pork chops to marinade at room temperature for at least 30 minutes. 4. Heat up oil in your skillet (preferably cast iron) over medium high heat. Once hot, add your pork chops in to the pan. 2 can normally fit. Sear on one side for 3-4 minutes. Flip and cook for another 3-4 minutes. Remove pork chops from heat and allow to rest for 5 minutes. 5. 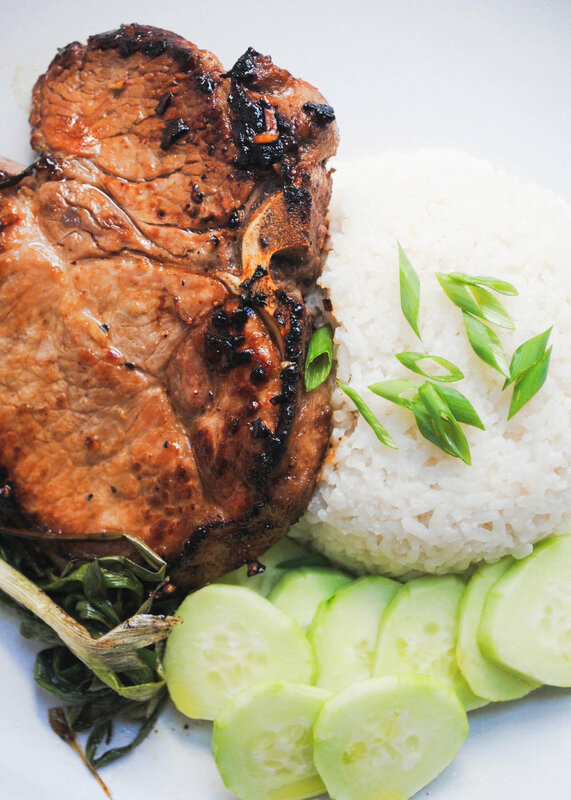 Serve pork chops with coconut rice and some refreshing thinly sliced cucumbers! Bonus step : sear some green onions in the skillet with the leftover oil and pork drippings and serve with the meal... so good!